Angiography (synonym of fatografi) is the method of roentgenologic examination of vessels (arterial, venous and lymphatic) by introducing in their clearance rentgencontrastnykh substances and subsequent x-ray. Angiography can identify as the state itself examined vessels and various pathological processes in organs, accompanied by a kind of change in blood or lymph circulation. Depending on the topography issleduemykh vessels of the following types angiography: a angiocardiography - study cavities of the heart and main vessels: Angiolieri - research vessels of the lungs; cerebral angiography is the study of brain vessels; the aortography - angiogram of the aorta and so on Angiography of the arteries is called arteriography. Angiography veins - venography, or phlebography, examination of lymph nodes and vessels, respectively limfadenopatia, outflow or lymphangiography. As contrast agents for angiography apply a water-soluble compound of iodine: gepac, cardiotest (35 - 70%), tritryst (not used for angiography of cerebral vessels! ), urographine, euroselecta and others] is Contraindicated angiography with individual intolerance of iodine-containing contrast agents. A few days before the proposed research is necessary to pre-test to determine whether the patient sensitivity to iodine. For this intravenously injected 1-2 ml of contrast and see during the day. Signs of yodizma (rash, conjunctivitis, rhinitis, dyspeptic phenomena or heart disorders) is a contraindication for angiography. During the collection of anamnesis in patients who have angiographic study, find out what they have allergic reactions. In these cases, to reduce allergic reactivity recommended for several days prior to angiography, assign patient diphenhydramine on 0,03-0,05 g 2-3 times a day. Angiography consists of two stages: surgical and radiological. 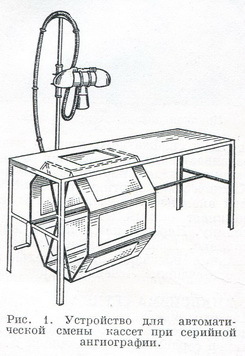 The study is performed with the patient on an empty stomach. The skin in the area of the proposed introduction of a contrast agent into the vessel carefully process (before shave the hair, in the time of the study wipe alcohol, 5% iodine alcohol solution). On sterile operating table sisters must be: a set of radiopaque catheters with varying degrees of curvature of the inner end, Crans-cannula for outer end of the catheter, the needle of the Seldinger, direct metal conductor, scalpel, hemostatic clips, capci, two syringes capacity of 20 ml, needles, sterile clothes and gauze napkins, 200 ml izotoniceski solution of sodium chloride with 3000 IU heparin, 40 ml of 0.5% solution novokaina. The success of the first stage is achieved by compliance with the rules of surgical asepsis, accurate presence of a search of the vessel and the introduction of needle and contrast medium into the lumen (otherwise possible complications). The success of the second stage requires clear coordination of the surgeon and radiologist (of roentgenologist). Pictures should be made in certain pre-agreed phase I study at shutter speeds corresponding to the type of x-ray apparatus and sight angiography. The outflow and the phlebography can be carried out on a regular diagnostic devices. Angiocardiography and angiography of major vessels (aortography) require along with a special device to automatically change tapes (Fig. 1) use of short excerpts (hundredths of a second) when the secondary voltage of 100 kV and power of anode current of 100 mA and higher. When working with the tunnel tapes (Fig. 2) replace them manually. The cartridge is: in a flat wooden box inserted movable metal frame (kasutatavatele)in which 6 cassettes size 24x30 see as the production of each shot tape with the recorded film progresses and in its place is served next cassette with unexposed film. Specialized agencies, which are different kinds of angiography, equipped with modern equipment and special technical devices. Last automatically (programmed) provide high-speed serial x-rays simultaneously in two projections. Angiography is performed by specially trained teams of doctors and nurses, owning both the technique and methods of angiography and ways emergency care when complications.